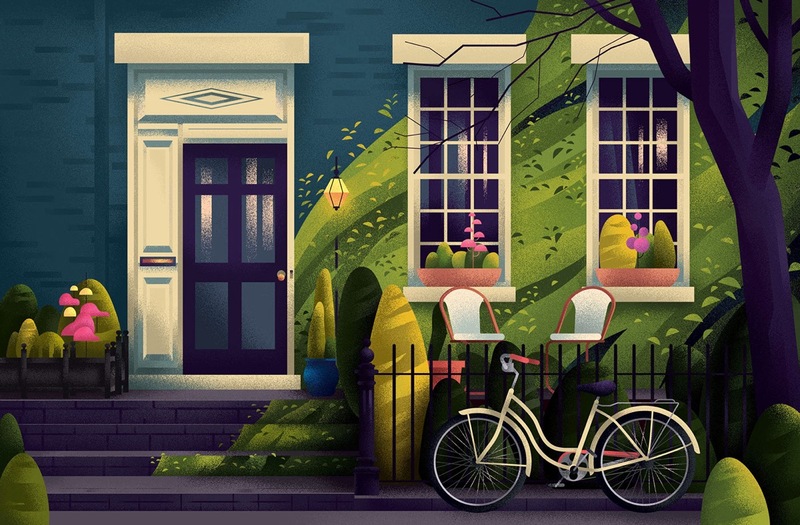 We don't normally feature illustrative artwork but when something like this comes along it is hard to ignore. These captivating drawings feature homes of all different styles of architecture, from all different parts of the world. 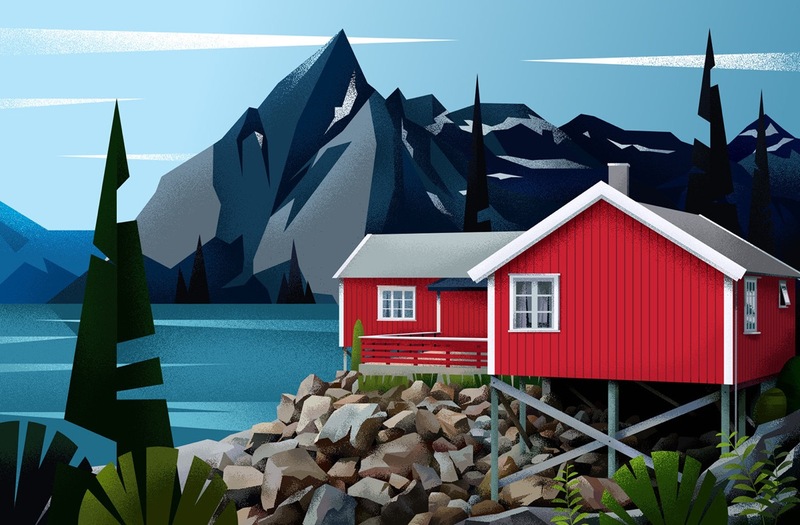 By using bold sweeping line and colour density, designer Muhammed Sajid has achieved a set of visuals that would not look out of place in a story book, on the walls of a private home or in a public art gallery. 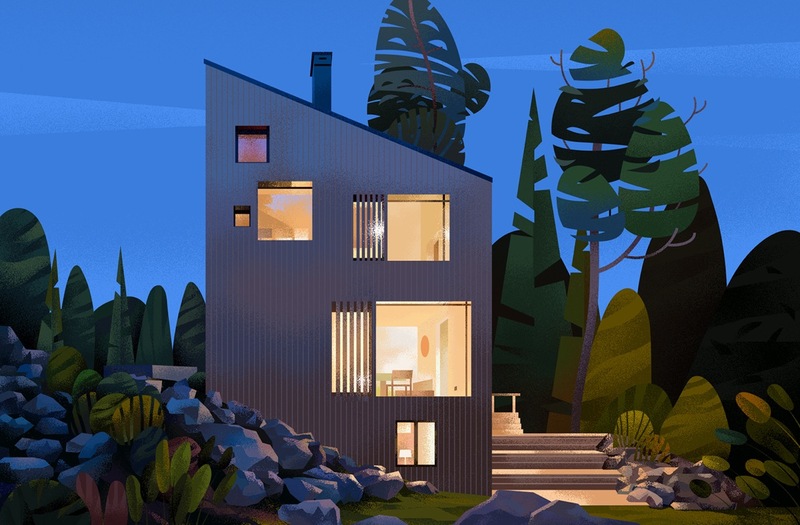 The illustrations come to life and appear almost three dimensional thanks to a play on natural light and deep shadow, plus the artists quirky stylisation of build textures and elements of nature. 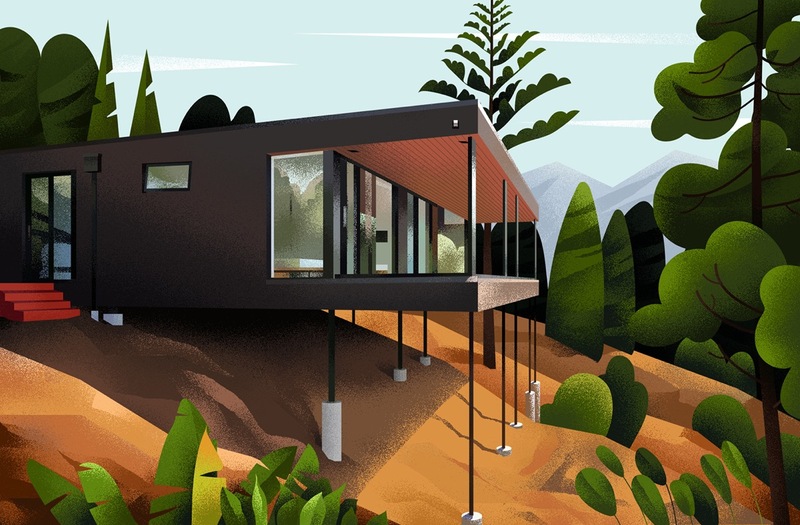 The first colour rich architectural illustration of this featured collection depicts a contemporary one level home that is balanced over an uneven terrain. Tall struts support one end of the flat profile home, extending in length as the landscape falls away. The architectural artist has produced a beautiful play on reflection over the windows of this second modern home exterior. Silhouettes of the surrounding treescape climb across the huge expanses of glass that make up the majority of the uppermost level. 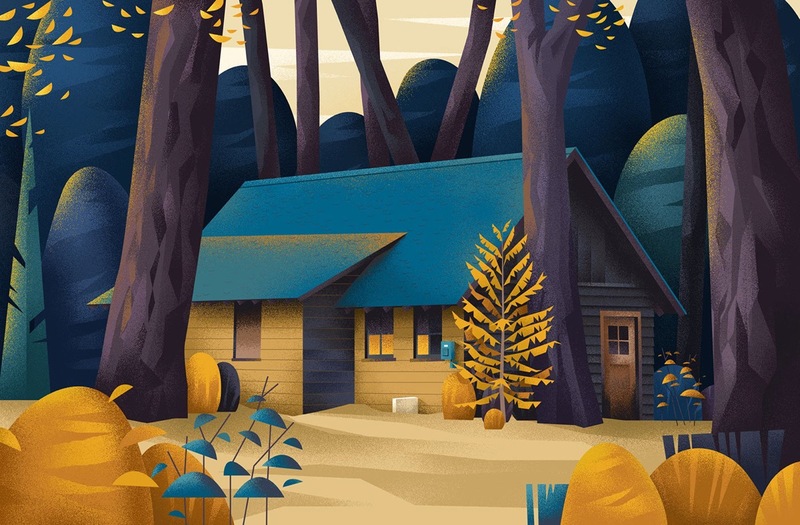 This quaint dwelling resides in a fairytale forest – or at least that’s how it looks in this magical picture where yellow autumn leaves tumble from the towering treetops. 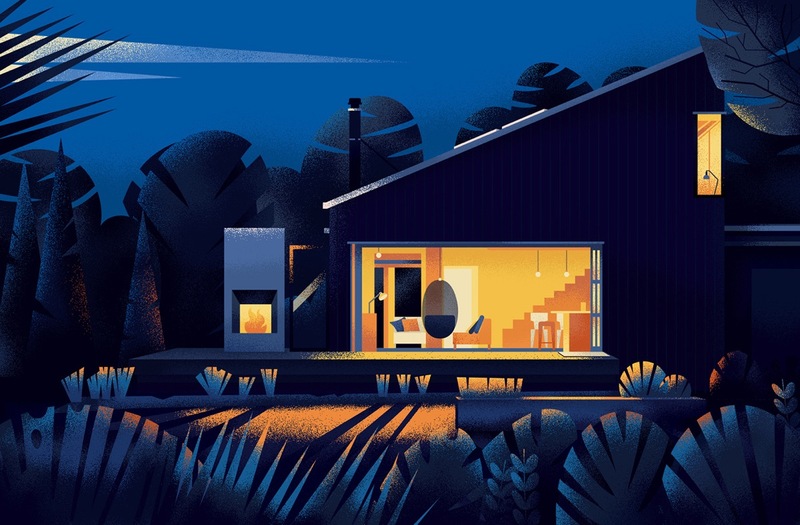 In contrast to the low yellow glow of an early summers evening, teal hues paint a dark rooftop and shadowy shrubs. 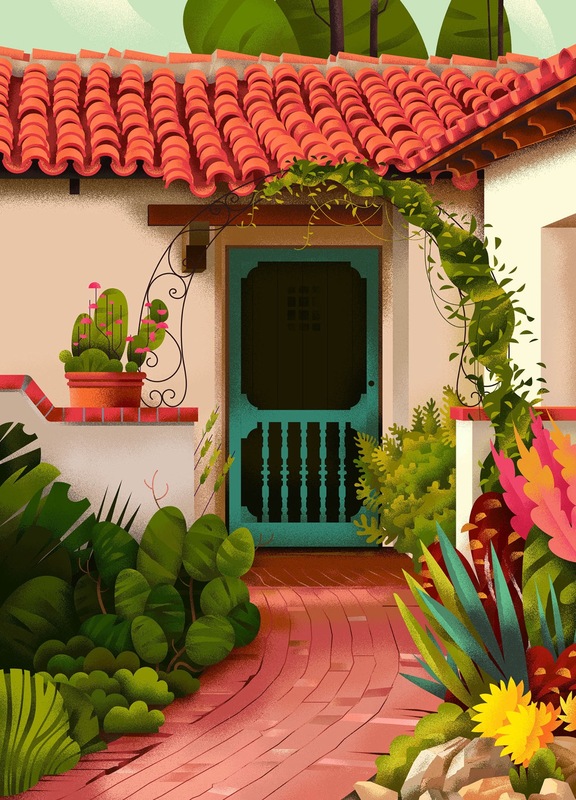 Charming higgledy-piggledy terracotta roof tiles jostle over the top of a joyful turquoise painted door. The door stands at the end of a red brick garden path that winds through a decorative arched trellis with climbing plants. 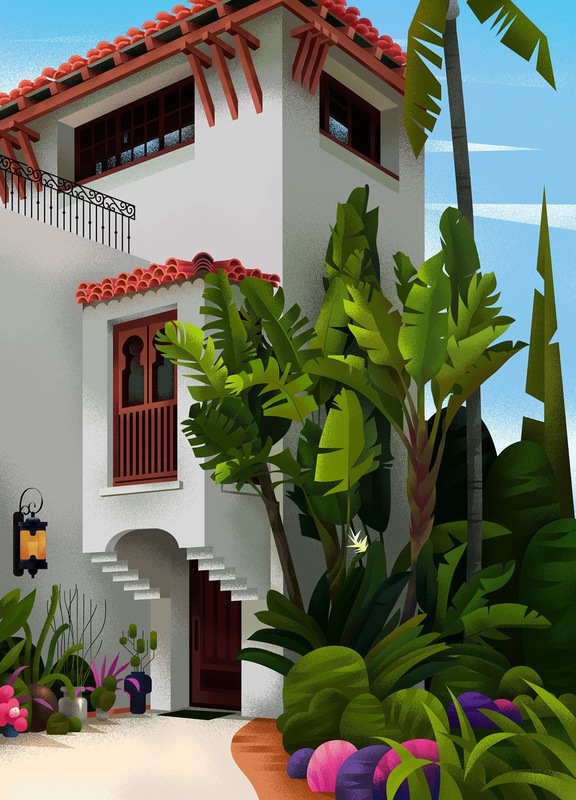 The leafy plants and cacti have been stylised as flat shapes, as though they were 2D cardboard cutouts. Slender archways are punched out of white render along the fascia of this exotic home. The water feature that stands in the grounds in front of the house echoes the curvaceous architectural features. 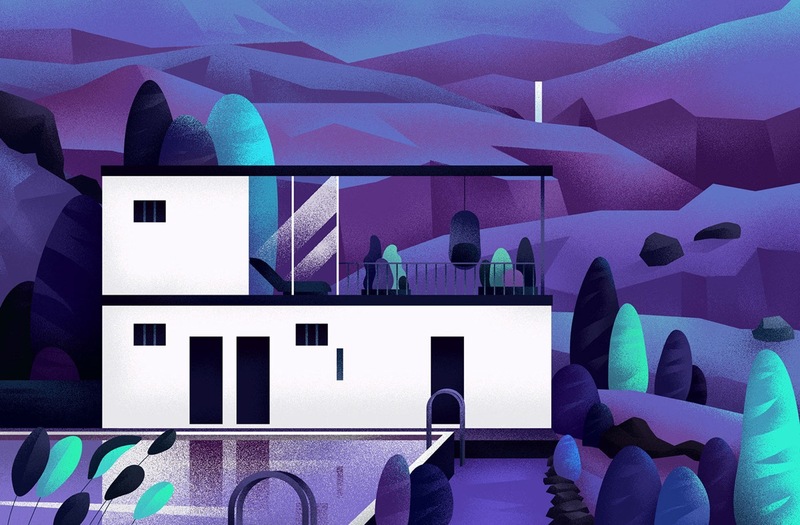 This moody purple and turquoise scene makes a dramatic backdrop to a crisp white contemporary build in its foreground. The rectangular volumes of the simple architectural silhouette appear as if punched out of purple paper. 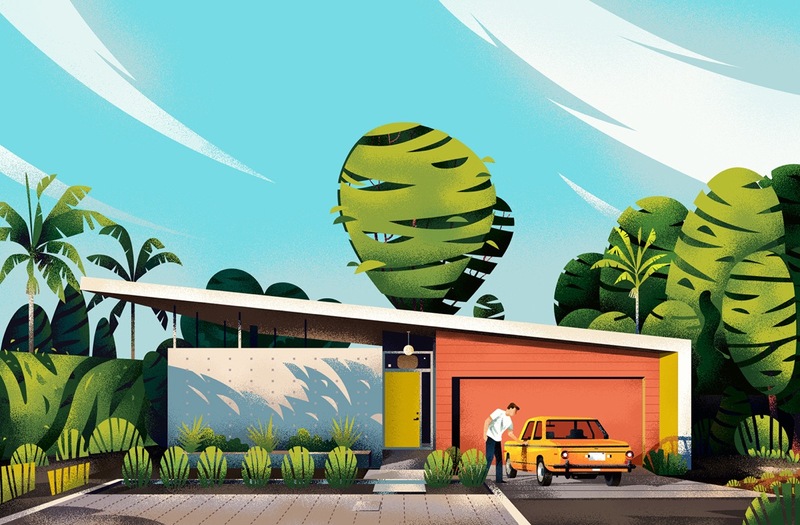 A retro 1950s space age vibe emanates from this colourfully illustrated home design, with its jaunty angled rooftop cutting through a cartoon canopy of trees. The tone and intensity of the colours used in this image describe an unmistakable summer heat below those clear blue skies. 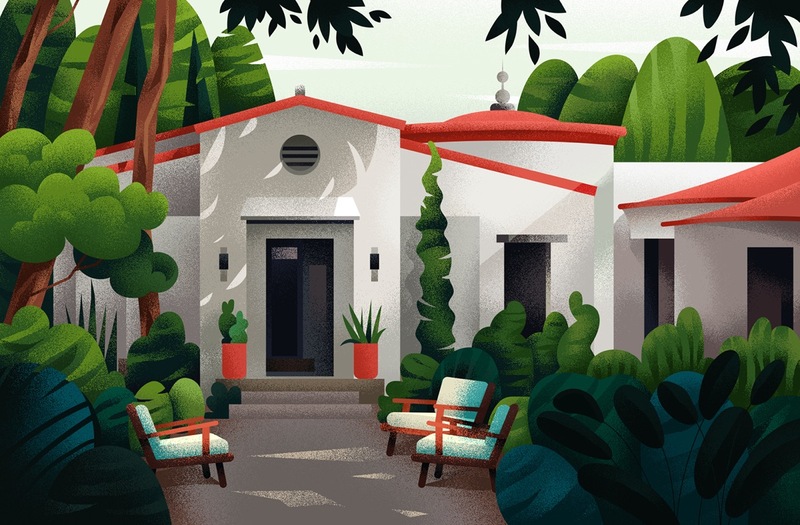 The artist has turned up the contrast between red and green elements in this home and garden design. 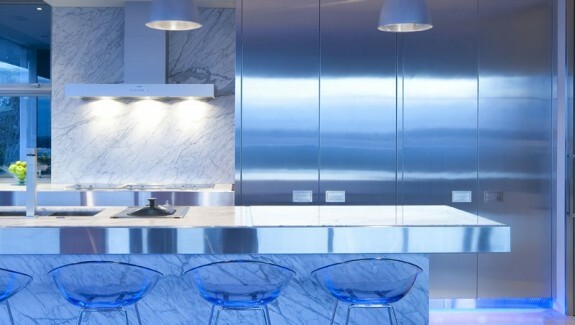 By utilising hues from opposite sides of the colour wheel the design achieves extra pop. The interior lights shining through the windows of this home look realistically luminescent, as though the image were plugged in at the mains. 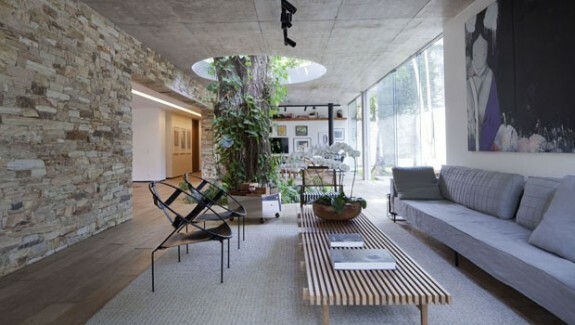 The surrounding architecture and landscape is knocked back in shade so that bleached out interior scenes, seen as snapshots through the windows, achieve a lightbox effect. The light spills out over rocks in the foreground. 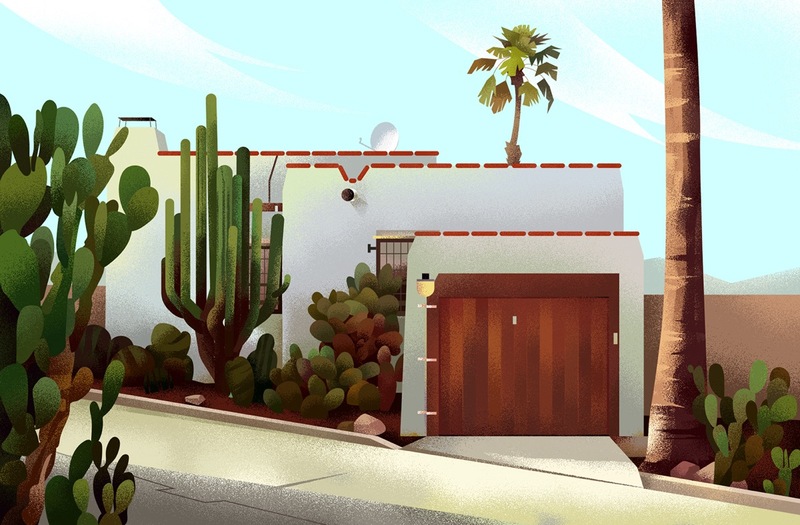 An elegant air breezes over this pretty home exterior that has oodles of curbside appeal. 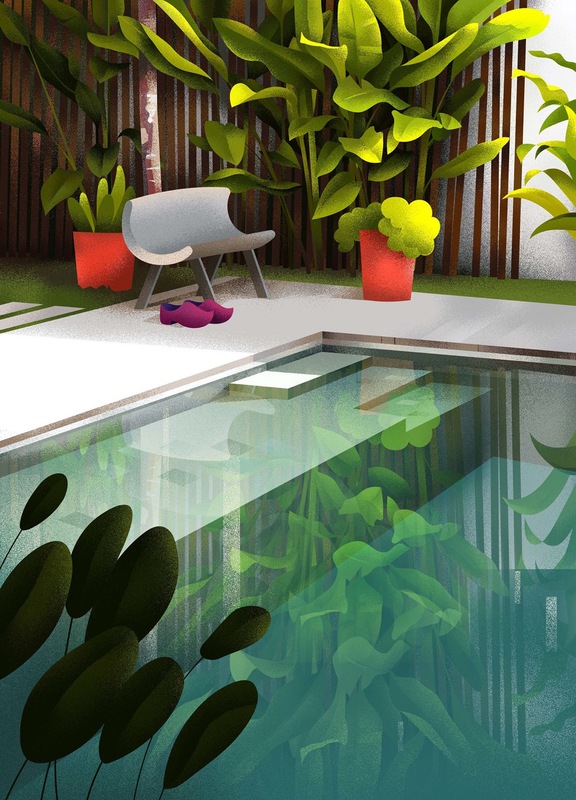 A fruity paint palette has been used to create a truly tropical atmosphere in this architectural drawing. 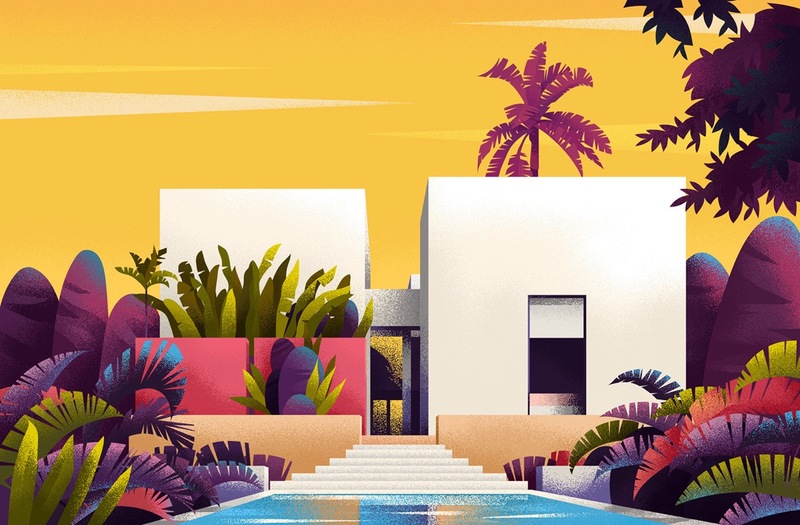 A mango yellow sky tops a landscape of purple palm trees and shrubs of pink, green and blue fronds. 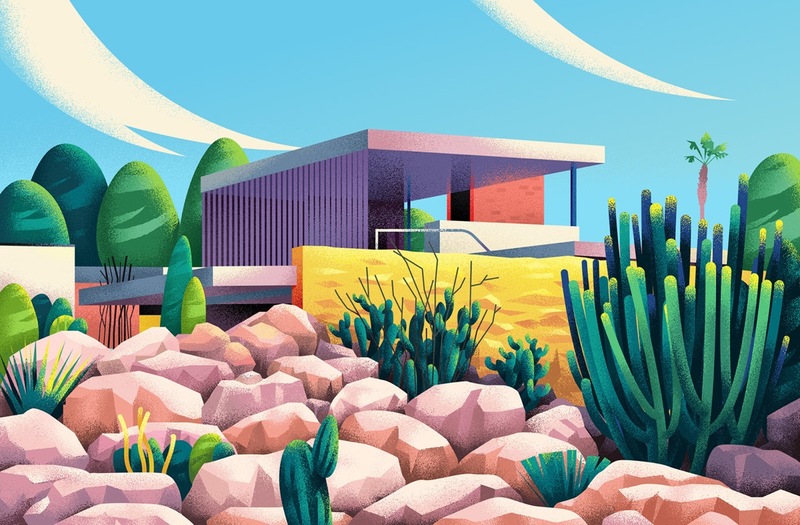 The cacti in this picture appear as moments of architectural design themselves. 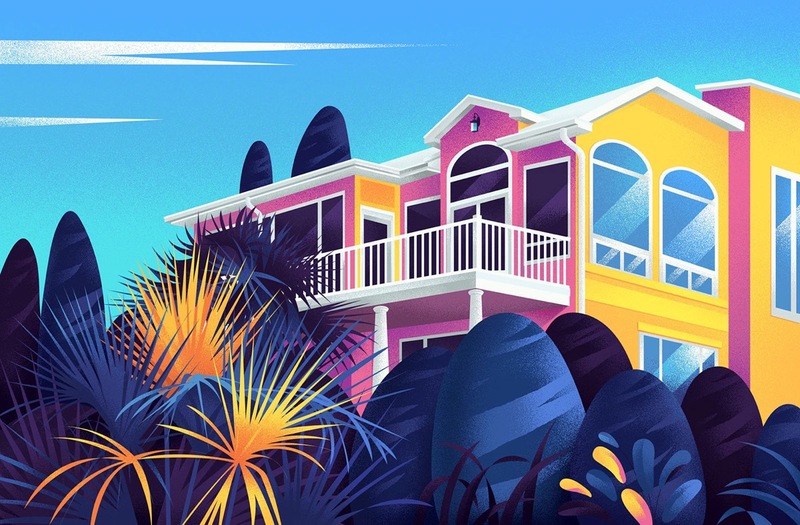 Clashing pink and yellow make this home illustration appear as though the house were covered in fondant, or cut and formed like the sponge of a Battenberg cake. 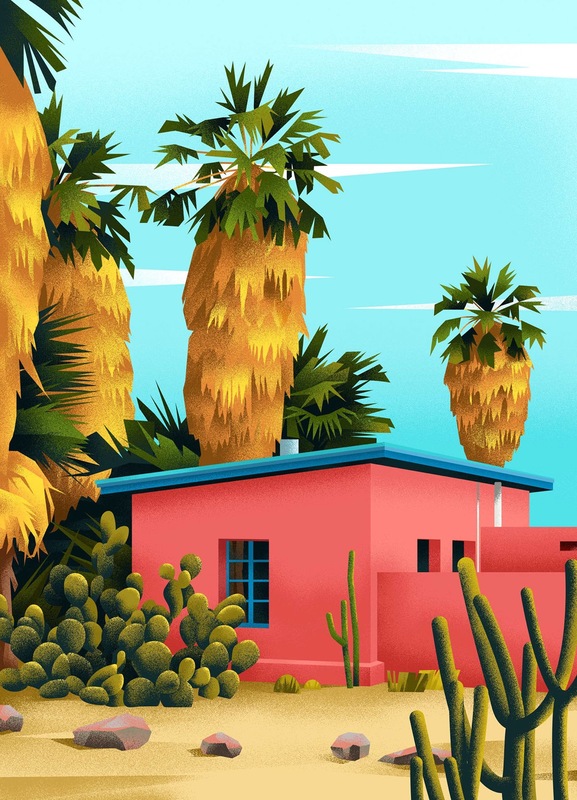 A handful of plant fronds in the foreground have been coloured to match the sweet styled depiction. A beautifully luminescent lightbox effect. 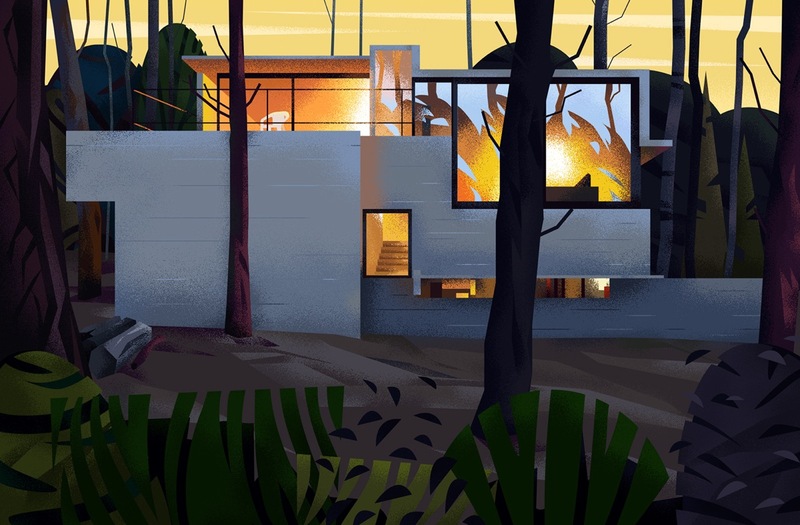 This time the home fires glow through an opening created by the retraction of bifold doors, making the inside and outside living areas work as one seamless space. An outdoor fireplace adds to the cosy glow that washes over a garden lawn below the terrace. Jagged rocks make a rugged scene behind a raised home set to be erected on challenging terrain. 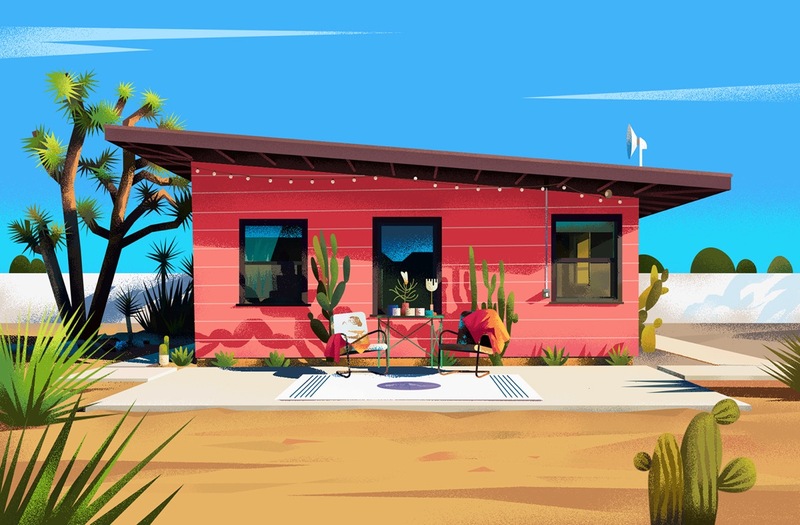 The red painted wood planking that covers the home exterior make for an offbeat cheerful contrast to the formidable rocks upon which it resides. 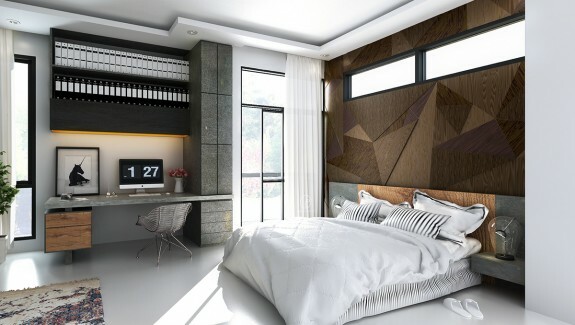 A daytime version of the purple painted picture that showed this contemporary two story home by night. In this version it is easier to appreciate the outdoor swing chair that takes in the view from an upstairs terrace, and to imagine taking a dip in the huge outdoor pool. String lights playfully decorate the asymmetrical roofline of this small single story building. A casual sun terrace looks out over an arid landscape. The beautiful reflections over this cool looking pool run deep and still, and perfectly accompany the crisp and contemporary pool patio design. 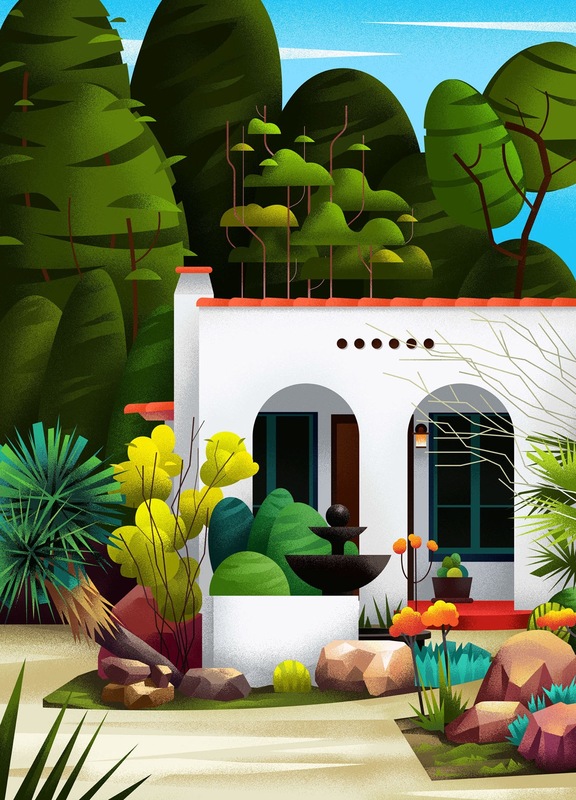 Architectural features abound over this exotic home exterior with colourful gardens. The front volume seems to extend impossibly over the homes front doorway, raised up and outward on two small inverted staircases with a shallow archway bridging the gap. 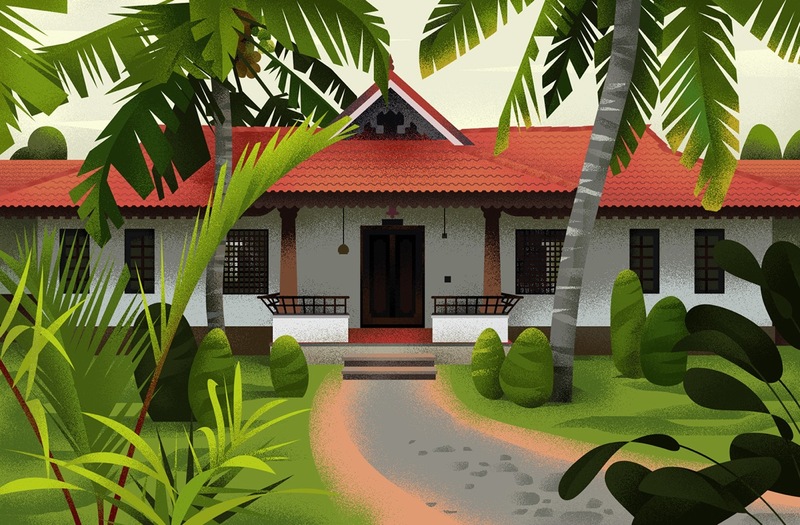 This illustration is representative of the Nalukettu houses of Kerala, India. Delicious parma violet colour sets this one apart from the rest, coupled with more sweet candy colours and a sweeping wispy cloudscape. Towering palm trees on bushy trunks steal the spotlight behind this understated build design that neatly nestles into well established haitat.